Description: A collection of quick one-shots featuring Yuzu and Mei. And pretty much everyone else! A few chapters are M-rated. This is probably the most hilarious fanfiction I’ve ever read. Despite the fact that there are some more serious, and even some pretty damn hot chapters happening as well, the focus lies on the more lighthearted chapters, featuring various very, very funny moments in the lives of Yuzu and Mei. It’s rare that a story makes me laugh that much, and especially that it makes me laugh out, but this one managed to do it numerous times. Description: After a chance encounter found them on the same side of a desperate struggle for peace, a friendship has blossomed between Fareeha and Angela. To the surprise of the both of them, it seems to be continuing to grow into something more. They each struggle to come to terms with their own feelings and fears as they each wait for the other to take the next step. This is a very rare kind of fanfiction. It’s one that draws you in immediately, keeps you interested despite the fact that everything happens waaaay too slow, but hits you hard when something finally does happen. I’m usually a hard judge when it comes to fanfiction, so finding the right one takes time for me, and I almost never start liking one after just the first chapters. Though, that is exactly what happened here. You can say I was sucked in right after the first few paragraphs even, and I seriously couldn’t stop reading for hours, and that’s super rare for me—so, yeah, it’s really a rare treat. Description: This had all started, Kumiko concluded, with the umbrella and a coffee order. Kumiko works at a coffee shop, one day meeting the breathtaking beauty Reina with a quite unique order. Since the anime just won’t deliver as much yuri as most of us are wishing for, you gotta look for “your fix” elsewhere. I had to go through quite a few rather unsatisfying Hibike! fanfics before finally finding this one. So, yeah, I don’t even think it’s necessary to mention that this one is totally worth your time, especially if you’re interested in a charming and fun story about these two cuties finally falling in love for real. 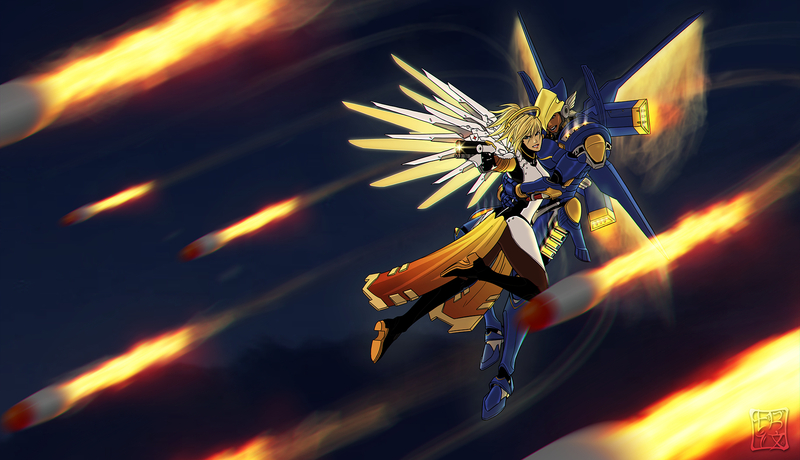 Description: Pharah and Mercy learn to accept their feelings for each other and slowly take their first steps. Apparently, this story is written by a friend of mine and more or less features some ideas or prompts I requested to see happen. As it turns out, I did not only get the content that I wanted, but also a whole story connecting these prompts of mine to something pretty damn awesome. This entry was posted in Fanfiction, Recommendations, Yuri and tagged Citrus, Hibike! Euphonium, Overwatch by Lena K.. Bookmark the permalink. D.Va x Symmetra, kinda crack pairing but nicely written fanfic. And last but not least D.Va x Mercy well, it was nice fanfic that left me with a smile. Though, I usually don’t go for fanfics with characters that I don’t know about. after last time, i’m not sure i can trust you. I really enjoyed the Euphonium one. I had previously read parts of the Brass Duet one, but the Coffee story was just wonderful. I have a newfound appreciation for Natsuki now. We doing fanfic recommends now? Alright, throw another vote in for Dezopen. Amazing overall yuri writer, whether it is Kannazuki, Mai Hime, Nanoha, whatever. Other good ones include anything by RadiantBeam, jen-chan-shaw, or Tsuyazakura Kouyuki (although the latter seems to have purged all of their fanfics). Tsuyazakura Kouyuki all the way. Oh did I love his stories….